Background: We used an in vitro tooth development model to investigate the effects of overactivation of the Wnt/β-catenin pathway during odontogenesis by bromoindirubin oxime reagent (BIO), a specific inhibitor of GSK-3 activity. Results: Overactivating the Wnt/β-catenin pathway at tooth initiation upregulated and ectopically expressed the epithelial markers Sonic Hedgehog (Shh), Epiprofin (Epfn), and Fibroblast growth factor8 (Fgf8), which are involved in the delimitation of odontogenic fields in the oral ectoderm. This result indicated an ectopic extension of the odontogenic potential. During tooth morphogenesis, Fibroblast growth factor4 (Fgf4), Fibroblast growth factor10 (Fgf10), Muscle segment homeobox 1 (Msx-1), Bone Morphogenetic protein 4 (Bmp4), and Dickkopf WNT signaling pathway inhibitor 1 (Dkk-1) were overexpressed in first molars cultured with BIO. Conversely, the expression levels of Wingless integration site 10b (Wnt-10b) and Shh were reduced. Additionally, the odontoblast differentiation markers Nestin and Epfn showed ectopic overexpression in the dental mesenchyme of BIO-treated molars. Moreover, alkaline phosphatase activity increased in the dental mesenchyme, again suggesting aberrant, ectopic mesenchymal cell differentiation. Finally, Bmp4 downregulated Epfn expression during dental morphogenesis. Conclusions: We suggest the presence of a positive feedback loop wherein Epfn and β-catenin activate each other. The balance of the expression of these two molecules is essential for proper tooth development. We propose a possible link between Wnt, Bmp, and Epfn that would critically determine the correct patterning of dental cusps and the differentiation of odontoblasts and ameloblasts. The mouse tooth is a good model for the study of regulatory pathways involved in cell differentiation, proliferation and organogenesis. Mouse tooth development begins around embryonic day 10.5 (E10,5) with a local thickening and oral epithelial invagination. Continuation of this invagination process results in the formation of epithelial tooth buds at E12.5–13.5. The mesenchymal cells condense around the buds, and after the bud stage, the tooth germ progresses to the cap (E14.5), early bell (E17.5) and late bell (E19.5) stages. From the bell stage onwards, the epithelial cells in contact with dentin differentiate into the enamel-producing ameloblasts (Thesleff and Hurmerinta, 1981; Martin et al., 1998; Ruch, 1998), and the dental papilla cells near the epithelium polarize and differentiate into dentin-secreting odontoblasts. At approximately E12.5, the potential to induce tooth formation is transferred from the dental epithelium to the dental mesenchyme (Mina and Collar, 1987; Lumsden, 1988). However, the exact molecular determinants of this odontogenic potential have not yet been completely elucidated. There are many signaling pathways involved in different stages of dental development. The Fibroblast growth factor (FGF), Sonic hedgehog (SHH), Wingless integration site (Wnt), and Transforming growth factor β (TGFβ) superfamilies are essential in tooth development (Jernvall and Thesleff, 2000; Thesleff and Mikkola, 2002). Wnt/β-catenin signaling is highly conserved in vertebrates, and the precise control of this pathway is required for normal tooth development. Wnt/β-catenin is regulated by the activity of the serine/threonine kinase GSK-3, which physically interacts with other proteins, including Axin and Adenomatous Polyposis Coli (APC). In the absence of Wnt signaling, cytoplasmic β-catenin is phosphorylated by this complex and is targeted for degradation by the ubiquitin-proteasome system (Seidensticker and Behrens, 2000). Binding of Wnt ligands to Frizzled (FZ) receptors and low-density lipoprotein-related protein (LRP) family co-receptors activates intracellular Disheveled (DVL) proteins, eventually leading to inhibition of the destruction complex. Therefore, binding of Wnt ligands to their receptors allows cytoplasmic β-catenin accumulation, nuclear translocation, and transcriptional activation by complexes of β-catenin and LEF/TCF transcription factor family members (Logan and Nusse, 2004). In the mouse, active Wnt/β-catenin signaling occurs throughout the different stages of tooth development, performing different roles in each stage (Liu and Millar, 2010; Lohi et al., 2010). SomeWnt protein inhibitors, such as Dickkopf-1 (Dkk1), bind to LRP5/6 coreceptors and thus block transmission of Wnt signals (Andl et al., 2002). A recent work has identified LRP6, a co-receptor in the canonical Wnt/β-catenin signaling cascade, contributing to the etiology of non-syndromic autosomal-dominant oligodontia (Massink et al., 2015). Loss of balance in the activation of the Wnt pathway produces serious problems in dental development. Increased Wnt/β-catenin signaling in conditional knockout mice results in numerous abnormal dental epithelial invaginations and supernumerary tooth formation, ectopic incisor and molar development, and alterations in the differentiation of ameloblasts and odontoblasts and dental mineralization (Järvinen et al., 2006; Thesleff, 2006; Wang et al., 2009; Ahn et al., 2010; Kim et al., 2011). Conversely, either genetic deletion of β-catenin or overexpression of Dkk1 results in complete inhibition of tooth development (van Genderen et al., 1994; Liu et al., 2008; Chen et al., 2009). In humans, mutations in Wnt10a lead to congenital hypodontia or tooth agenesis that can be either isolated (Kantaputra and Sripathomsawat, 2011) or associated with ectodermal dysplasia (Adaimy et al., 2007). Growth factors and signaling molecules, such as Wnt, Fgf, Shh, and Bmp, are interconnected in dental development. In particular, Fgf4 has been described as a downstream target for Lef1 and the Wnt pathway in early tooth primordia (Kratochwil et al., 2002). Other members of the FGF family, such as Fgf9 and Fgf10, have also been associated with the Wnt pathway during odontogenesis (Cobourne and Sharpe, 2010). FGF plays essential roles in multiple biological processes including cellular proliferation, differentiation and survival (Unda et al., 2000; Barrientos et al., 2008; D'Andrea et al., 2009). It has also been reported that dental epithelial Shh expression is induced by mesenchymal FGFs (Kratochwil et al., 1996). Likewise, Wnt signaling in the dental mesenchyme is also essential for inducing Shh expression in the dental epithelium (Fujimori et al., 2010). Shh activation is a good indicator of development of the dental epithelium because in early stages, Shh is specifically expressed in the oral ectodermal regions where future incisors and molars will be formed (Dassule and McMahon, 1998). Additionally, members of the BMP protein family are expressed from the beginning of odontogenesis and play crucial roles in the transition from the bud stage to the cap stage and in terminal dental cell differentiation (Wang et al., 2004; Jiang et al., 2013). Epiprofin/Specificity Protein 6 (Epfn) is a Krüppel-like family (KLF) transcription factor that is critically involved in tooth morphogenesis and ameloblast and odontoblast differentiation. However, its mechanism of action is still not fully understood. During odontogenesis, Epfn expression is restricted to the dental epithelium of developing molars and incisors from the bud stage to the terminal bell stage. At the late bell stage, Epfn is highly expressed in the preameloblastic inner enamel epithelium, and at that time, its expression also extends to the dental papilla-derived odontoblasts (Nakamura et al., 2004). The phenotype of Epfn-knockout mice reveals profound alterations in tooth morphogenesis and differentiation, as well as severe hyperdontia featuring supernumerary incisor and molar teeth (Nakamura et al., 2008). Our previous studies suggest that Epfn enhances canonical Wnt/β-catenin signaling in the developing dental pulp mesenchyme, a condition that promotes the activity of other downstream signaling pathways, such as BMP signaling, that are fundamental for cellular induction and ameloblast differentiation (Jimenez-Rojo et al., 2010; Ibarretxe et al., 2012). Recent studies have shown a role for Epfn in keratinocyte differentiation by reducing E2F transactivation and inducing Notch1 expression (Nakamura et al., 2014). In addition, Epfn plays a critical role in the differentiation of inner enamel epithelium into ameloblasts. A genetic linkage between a 2-bp insertional mutation of Sp6 gene and the amelogenesis imperfecta phenotype in rats has been found. Thus, it has been proposed the addition of Sp6 mutation as a new molecular diagnostic criterion for the autosomal recessive amelogenesis imperfecta patients (Muto et al., 2012). The aim of this work was to separately study the effects of overactivating Wnt/β-catenin signaling during each of the different stages of odontogenesis and then to relate these changes to the expression of Epfn and of other downstream signaling effectors such as Bmp, Fgf, and Shh. Our model consists of transient application of BIO, a highly potent, selective, reversible, and competitive inhibitor of GSK-3 (Meijer et al., 2003), to hyperactivate Wnt/β-catenin in organotypic cultures of isolated branchial arches and first molars at various developmental stages. This allows the evaluation of the effect of the Wnt/β-catenin signaling cascade during odontogenesis in the absence of interference related to overactivation/inhibition of this pathway during other periods of dental development. We analyzed the effects of Wnt/β-catenin hyperactivity on dental mesenchymal proliferation and odontoblast and ameloblast differentiation. In addition, we investigated the relationship between the canonical Wnt pathway and other signaling effector molecules involved in odontogenesis, specifically Fgf4, Fgf9, Shh, Wnt10b, Dkk1, Bmp4, and Epfn. (2′Z,3′E)-6-bromoindirubin-3′-oxime (BIO; Calbiochem) is a cell-permeable bis-indolo(indirubin) compound that acts as a highly potent, selective, reversible, and ATP-competitive inhibitor of GSK-3. 1-Methyl-BIO (MetBIO; Calbiochem) is a cell-permeable N-methylated analog of BIO that serves as a relevant inactive control of kinase activation. BIO and MetBIO were dissolved in dimethyl sulfoxide (DMSO, SigmaAldrich) and diluted in culture media at 20 μM for in vitro experiments. Mouse first branchial arches at E11.5 and first lower molars at three stages of tooth development (E14.5, E17.5, and E19.5) were dissected by microsurgery with scalpels, in Hank's buffered saline solution (Gibco) under a stereomicroscope. Teeth were placed on hydrophilized polytetrafluoroethylene (PTFE) MillicellTM filters (0.4 μm diameter, Millipore) and cultured in 1 ml Roswell Park Memorial Institute (RPMI) medium (Gibco) supplemented with 0.18 mg ascorbic acid, 2 mM L-glutamine (Gibco), 0.1 mg kanamycin (Thermo-Fisher Scientific)and 20% fetal bovine serum (Biochrom), at 37°C and 5% CO2. Explants were treated with BIO and MetBIO (control) at 20 μM for 24 or 48 h or for 4 or 6 days. E19.5 teeth were not maintained in culture for more than 4 days in vitro due to size-related limitations on nutrient and oxygen exchange. The culture medium was changed every 2 days until the end of the culture. Some explants were cultured with 10 μM 5-bromo-2′-deoxyuridine (SigmaAldrich) for 2 h. Samples were processed for histology, in situ hybridization or immunofluorescence. The experiments with mice have been approved by the ethic committee of the University of the Basque Country, UPV/EHU (346/2014/UNDA). Tooth cultures were fixed overnight at 4°C in 4% paraformaldehyde (SigmaAldrich). Subsequently, they were cryoprotected overnight at 4°C in 30% sucrose and then embedded in OCT (Tissue-Tek) and stored at −80°C until use. Frozen sections (15 μm) were obtained using a cryostat (Shandon) and post-fixed in 4% paraformaldehyde for 10 min. Some sections were stained with hematoxylin-eosin or permeabilized using 1% Triton X-100 (SigmaAldrich) in PBS (SigmaAldrich) and blocked with 10% fetal bovine serum for 1 h at room temperature. These samples were incubated overnight at 4°C with the following antibodies:mouse anti-bromodeoxyuridine-fluorescein monoclonal antibody 1:200 (Roche 11202693001), rabbit anti-cleaved Caspase3 1:200 (Asp175; Cell Signaling) anti-Nestin 1:100 (ab5968; Abcam) and anti-Amelogenin 1:200 (ab59705 Abcam) antibodies. The secondary antibody used was Alexa Fluor 488-conjugated anti-rabbit antiserum (dilution 1:500). Cell nuclei were stained with DAPI (4′,6-Diamidino-2-phenylindole, SigmaAldrich) 0.5 μg/ml. Immunofluorescences were performed by triplicate and images were obtained using an Olympus FluoView FV500 confocal microscope or a Zeiss Axioskop fluorescence microscope with Nikon DS-Qi1Mc and Nikon NIS-Elements software, respectively. Digoxigenin-11-UTP-labeled single-stranded RNA probes for murine Lef1, Bmp4, Msx1, Fgf9, Fgf10, Fgf4, Epfn, Dkk1, Wnt10b, and Shh were prepared using a DIG RNA labeling kit (Roche Applied Science) according to the manufacturer's instructions. For whole-mount in situ hybridization, E11.5 branchial arches and E14.5 and E17.5 first molars cultured with 20 μM BIO or MetBIO for 24 or 48 h were fixed in 4% paraformaldehyde/PBS overnight, dehydrated in methanol, and kept at −20°C until use. Whole-mount RNA in situ hybridization was carried out according to Nieto et al. (1996). Some hybridized tissues were sectioned at 15 μm using a Shandom cryostome. Images were obtained with a Zeiss Stemi 2000-C stereomicroscope equipped with a Canon PowerShot A80. The number of the samples (n) for the in situ hybridization was 10 for each experimental condition, both control and BIO. Hybridization for each probe was performed at least twice. MDPC23 cells which derived from mouse dental pulp of between 60–70 total culture passages (Hanks et al., 1998), were cultured in standard DMEM medium (Gibco) supplemented with 20% fetal bovine serum (FBS), L-glutamine, and antibiotics. Cells were collected, counted and seeded on 96-well flat bottom plates (100 μL per well, 25000 cells/well), incubated overnight for attachment to the substrate, and then treated in triplicate with 0–100 μM MetBIO or BIO. After 24 h of treatment, XTT Cell Proliferation Assay (Roche Diagnostic) was performed following the manufacturer's protocol. Absorbance at 490 nm was measured using a spectrophotometer (Biotek Synergy HT), and MDPC-23 cells cultured in the absence of MetBIO or BIO were taken as 100% of viability. Statistical analyses were performed with IBM SPSS Statistics v.22 software. All data sets were subjected to a normality test prior to analysis to confirm that they followed a parametric distribution. Comparison between two groups was performed using unpaired two-tailed Student's t-test. Comparison between multiple groups was performed using One-way ANOVA followed by Tukey or Scheffe post-hoc tests. P ≤ 0.05 was considered to be statistically significant. Confocal and fluorescence images were analyzed using Image J (Image processing and Analysis in Java) software. Images were edited using Photoshop CS5 software. Constitutive activation of β-catenin in the epithelial tooth buds or the deletion of β-catenin in the dental mesenchyme results in the formation of supernumerary teeth (Järvinen et al., 2006; Liu et al., 2008; Fujimori et al., 2010). To clarify the mechanism by which Wnt/β-catenin-mediated hyperdontia occurs, we studied the expression of selected genes related to the initiation of odontogenesis during the early stages of dental development, after overactivating the canonical Wnt pathway by BIO in isolated mouse branchial arches. Previously to our study, we evaluated cell viability and apoptosis in the presence of different concentrations of BIO. We used XTT assay of dental pulp-derived MDPC-23 cells, which can be induced to differentiate into an odontoblastic phenotype under specific conditions (Hanks et al., 1998). BIO reagent induced a dose-dependent reduction of viability in MDPC-23 cells after 24 h. The EC50 value was stablished at 25 μM (Supplementary Figure 1A). When we studied the apoptotic effect of 20 μM BIO in E14.5 molars cultured for 6 days, Caspase3 was detected in cells of the oral epithelium of control and BIO-treated molars. On the contrary, BIO barely induced apoptosis in the dental epithelium and mesenchyme cells of E14.5 molars cultured for 6 days (Supplementary Figure 1B). Accordingly, concentrations of BIO between 10-20 μM were considered optimal in our organ culture experiments. First, we analyzed the expression of Lef1 in E11.5 mouse lower mandibles after culture with BIO for 24 h. Lef1 is a direct effector of Wnt/β-catenin, and increased mRNA levels for Lef1 are hereby considered a positive control for Wnt hyperactivity. This result indicates the effectiveness of our treatment to overactivate the canonical Wnt pathway at early stages of odontogenesis (Figures 1E–J). In whole E11.5 mandibles, we found that the expression levels of Lef1 and Msx1 were increased after treatment with BIO in the presumptive regions of incisors and molars (Figures 1A–D). Fgf8, Epfn, and Shh are some of the major signaling molecules expressed in the oral epithelium in the initial stage of dental development. We found that in BIO-treated branchial arches, the expression levels of Fgf8, Epfn, and Shh were upregulated, and importantly, their expression fields extended ectopically to other neighboring areas (Figures 1F,H,J). Figure 1. E11.5 first branchial arches cultured with MetBIO (control) or BIO (40 μM) for 24 h. In situ hybridization for Lef1 (A,B), Msx1 (C,D), Fgf8 (E,F), Epfn (G,H), and Shh (I,J) mRNA. The expression of these genes increased and extended to the distal region of branchial arches in BIO treatment samples, when compared to controls. Arrows and arrowheads indicate the presumptive molar and incisor region, respectively. Scale bar: 200 μm. As we described in a previous report, overactivation of the Wnt/β-catenin pathway during dental morphogenesis stage causes a delay in dental development and deficiencies in the formation of the inner dental epithelium. Under those conditions, dental mesenchymal and epithelial cells did not properly polarize and organize (Aurrekoetxea et al., 2012). We decided to further investigate the characteristics of these dental cells and tissue differentiation defects. Molars treated with BIO for 6 days exhibited different abnormalities, in which the inner dental epithelium was the most affected structure. In addition, dental ridges where characteristically blunted and contained no polarized epithelial cells, in contrast to the control samples, which showed polarized preameloblasts. Moreover, in BIO samples, mesenchymal odontoblastic precursor cells were completely disorganized and no dentin extracellular matrix production was detected (Figures 2A,B). As we described in a previous report, the expression of the mature odontoblast cell marker Nestin in control molars was limited to mesenchymal cells facing the inner dental epithelium. However, in BIO-treated molars, the expression of Nestin spread ectopically to subodontoblastic cell layers in the dental mesenchyme (Aurrekoetxea et al., 2012). Figure 2. E14.5 first molars cultured with MetBIO (control) or BIO (20 μM) for 6 days. Control molar sections stained with hematoxylin-eosin (A) had normal development of dental cusps, clear polarization of the inner dental epithelia cells (ide), odontoblast differentiation (od), and a thin layer of predentin (pd). In contrast, molars cultured with BIO treatment (B) showed an irregular and disorganized dental cusp pattern, non-polarized cells in the inner dental epithelium and an undifferentiated odontoblastic layer. Alkaline phosphatase activity spread all over the dental mesenchyme in BIO-treated molars (D), but in control samples, enzymatic activity was detected in only in the odontoblastic and subodontoblastic layers (C). The dotted region corresponds to dental epithelium. Od, odontoblasts; ide, inner dental epithelium; pd, predentin. Scale bar: 200 μm. Alkaline phosphatase (ALP) activity is an important characteristic of mineralizing cells of mesenchymal origin. Thus, we wanted to assess whether the change in Nestin expression would be paralleled by that of ALP in BIO-treated molar teeth. In control molars, ALP activity was detected in the stellate reticulum, odontoblasts, and subodontoblastic cells, whereas preameloblasts were negative for ALP activity (Figure 2C). ALP activity in BIO-treated molars completely differed from that in the controls: it was greatly increased and extended throughout the entire mesenchymal region (Figure 2D). Similarly, the increase in ALP activity in response to Wnt/β-catenin overactivation also correlated with the overexpression of other odontoblastic differentiation markers such as Bmp4 and Epfn (Figure 3F) and their extension to ectopic areas in the dental papilla region. Figure 3. E14.5 first molars cultured with MetBIO or BIO (20 μM) for 48 h. In situ hybridization for Lef1 (A,B), Bmp4 (C,D), Epfn (E,F), Dkk1 (G,H), Wnt10b (I,J), and Shh (K,L). In the BIO treatment, labeling increased for Lef1, Dkk1, Bmp4, and Epfn gene expression but decreased for Wnt10b and Shh. The dotted region corresponds to the enamel organ, including the inner dental epithelium. Scale bar: 200 μm. The increased expression of Lef1, after culture with BIO, indicates the effectiveness of our treatment to overactivate the canonical Wnt pathway at the morphogenesis stages of odontogenesis (Figures 3A,B). Similarly, Bmp4 and Epfn enhanced in dental mesenchyme of E14.5 molars cultured with BIO (Figures 3C–F). We wanted to evaluate the effect of this sustained overactivation of Wnt/β-catenin on the expression of the natural regulators (both activators and inhibitors) of this pathway in vivo. Dkk1 is expressed in the oral ectoderm at the beginning of odontogenesis (E11–12); later on, its expression is restricted to the dental mesenchyme (Fjeld et al., 2005). In our organotypic culture system, compared with the controls, BIO treatment for 48 h increased Dkk1 expression in the dental mesenchyme of E14.5 molars (Figures 3G,H). During in vivo tooth development, Wnt10b is expressed in the presumptive regions of incisors and molars in the first branchial arches (E11.5; Dassule and McMahon, 1998). At the stage of tooth morphogenesis (E14.5), Wnt10b expression is restricted to the primary enamel knot. Dkk1 downregulates Wnt10b expression in the primary enamel knot during tooth morphogenesis (Liu et al., 2008). In our model, overactivation of the Wnt/β-catenin pathway using BIO dramatically reduced Wnt10b expression in the inner dental epithelium during tooth morphogenesis (Figures 3I,J). Shh is another important signaling molecule that appears to be critically associated with dental morphogenesis and dental cell differentiation (Dassule et al., 2000; Gritli-Linde et al., 2002). In our organotypic culture system, overactivation of Wnt/β-catenin induced a decrease in Shh expression in cultures of E14.5 molars, but the signal did not completely disappear (Figures 3K,L). Some members of the fibroblast growth factor family, such as Fgf4 or Fgf10, are essential for cell proliferation and for the correct formation of tooth cusps (Gritli-Linde et al., 2002). We studied the expression of Fgf genes in molar samples after hyperactivation of Wnt/β-catenin. In our experiments, the expression of Fgf9 increased slightly in molars treated for 48 h with BIO (Figures 4A–B′); however, the expression of Fgf4 and Fgf10 increased markedly (Figures 4C–F′). The most striking change in expression was observed for Fgf4, which was normally restricted to the enamel knots in control samples and whose presence appeared greatly enhanced and extended along the inner dental epithelium in samples treated with BIO (Figures 4D,D′). Fgf10 expression was also upregulated, but this increase was restricted to the mesenchymal region (Figures 4E–F′). Figure 4. E14.5 first molars cultured with MetBIO or BIO (20 μM) for 48 h. In situ hybridization on whole molars and sections for Fgf9 (A,B′), Fgf4 (C,D′), and Fgf10 (E,F′). Fgf9 was clearly expressed in the inner enamel epithelium in control cultures (A,A′), and the staining slightly increased in BIO-treated molars (B,B′). In control samples, Fgf4 was expressed exclusively in the enamel knots (C,C′, arrows), but treatment with BIO spread the staining to the inner dental epithelium (D,D′, arrows). Fgf10 labeling was restricted to the subodontoblastic layer in controls (E,E′), but the expression spread into the dental mesenchyme in BIO cultures (F,F′, arrow). Scale bar: 200 μm. Since we had observed that Fgf expression increased after treatment with BIO both in branchial arches and in tooth morphogenesis stages, and given the wide-known growth promoting effect of FGFs, we analyzed the rate of in vitro cell proliferation in first molars undergoing Wnt/β-catenin overactivation by BIO. Thus, first molars were isolated at E14.5, E17.5, and E19.5 (morphogenesis, pre-odontoblast and ameloblast cell differentiation stages, respectively) and treated with BIO for 6 or 4 days (only for E19.5 molars). First, quantification of BrdU immunohistochemical labeling revealed a significant increase in cell proliferation in the dental mesenchyme of BIO-treated E17.5 teeth compared with the control. BIO-treated E14.5 molars increased cell proliferation but not significantly, and 19.5 molars showed cell proliferation similar to that observed under control conditions (Figure 5A). Figure 5. (A) Proliferation of dental mesenchymal cells of E14.5, E17.5, and E19.5 first molars treated with Met-BIO or BIO (20 μM) for 6 or 4 days. Graph (left) presents the normalized percentages of bromodeoxyuridine (BrdU)-positive cells from different culture samples, with respect to respective controls. Immunofluorescence for BrdU (right) of cultured molars showing positive (proliferating) cells in the dental mesenchyme. Increased cell proliferation was found in BIO-E14.5 and BIO-E17.5 (statistically significant) cultured molars. Scale bars: 200 μm. ***p < 0.005. (B) Dental mesenchyme growth of E14.5, E17.5, and E19.5 first molars treated with Met-BIO or BIO (20 μM) for 6 or 4 days. 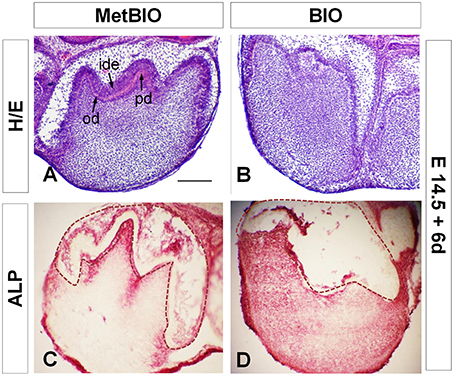 Graph (left) shows that Wnt/β-catenin overactivation promoted increased growth and enlargement of mesenchymal size when molars were treated with BIO from the tooth morphogenesis (E14.5) and predifferentiation (E17.5) stages. To the right, stereoscopic micrographs show the dental mesenchyme sizes of control and treated molars. Scale bars: 200 μm. *p < 0.05; **p < 0.01; ***p < 0.001. Next, we examined whether the increase in cellular proliferation was consistent with the increased size detected in E14.5 and E17.5 treated molars. Our data revealed that after treating E14.5 and 17.5 first molars with BIO for 6 days, the molar mesenchyme increased significantly in size. However, the dental papilla size of E19.5 first molars cultured with BIO for 4 days did not increase significantly (Figure 5B). These data seem to show a direct relationship between increased cell proliferation and the mesenchymal size enlargement that occurred in BIO-treated molars. The in situ hybridizations performed on E14.5 tooth germs treated with BIO for 48 h revealed that Epfn expression extended to subodontoblastic layers of dental mesenchyme (Figure 6B), whereas in control samples, Epfn remained restricted to the inner dental epithelium (Figure 6A). To elucidate the overexpression relationship between Bmp4 and Epfn, E14.5 incisors were cultured for 24 h in the presence of microbeads containing Bmp4 or BSA (control; Figure 6C). We observed that in the regions near the Bmp4 microbeads, the expression of Epfn dramatically decreased in comparison to the BSA (control; Figure 6D). These results indicated that Bmp4 downregulated Epfn expression in incisors, at least during the dental morphogenesis stage. Figure 6. Epfn in situ hybridization of E14.5 incisors cultured with microbeads containing Met-BIO, BIO (20 μM), or BMP4. Wnt/β-catenin overactivation induced an increase in Epfn expression in the dental mesenchyme (B) compared to the control (A). In situ hybridization for Epfn on E14.5 incisors cultured for 24 h in the presence of BSA (control) or Bmp4 beads (C,D). 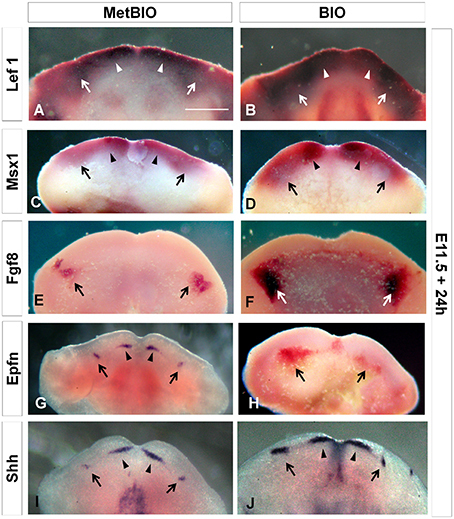 Bmp4 downregulated (arrowhead) Epfn expression in incisors during the morphogenesis stage. Scale bar: 200 μm. We studied whether the effects described in the earlier stages of tooth morphogenesis were also present at the differentiation stages of odontoblasts (E17.5) and ameloblasts (E19.5). Thus, in the presence of BIO or Met-BIO (control) we cultured E17.5 and E19.5 first molars for 6 and 4 days, respectively. In control molars, dental mesenchymal cells differentiated into functional odontoblasts secreting dentin, and the inner dental epithelial cells became well-polarized cells in the ameloblastic lineage. Moreover, these molars exhibited developed tooth cusps with predentin/dentin (Figures 7A,C,E,E′,G,G′), mesenchymal odontoblasts that stained positively for Nestin (Figures 7I,I′,K,K′), and epithelial ameloblasts that produced Amelogenin protein (Figures 7M,M′,O,O′). Additionally, first molars in E17.5 and E19.5 BIO-treated cultures showed severe developmental delays, particularly in ameloblast and odontoblast differentiation. BIO-treated molars showed an important delay in the differentiation of odontoblasts, and these cells were barely functional and produced little or no dentin at all (Figures 7B,D,F,F′,H,H′). Nestin labeling was less intense for the odontoblastic tissue area (Figures 7J,J′,L,L′) but was nevertheless extended to subodontoblastic cell layers of the dental mesenchyme, especially in E17.5 molars treated with BIO (Figures 7J,J′), similarly to our observations in E14.5 samples treated with BIO. Additionally, molars treated with BIO showed a near absence and very remarkable reduction of polarization of preameloblastic cells of the inner dental epithelium. Consistently, the presence of Amelogenin was reduced in the enamel layer of samples treated with BIO, both in cultures of E17.5 molars and in cultures of E19.5 molars (Figures 7N,N′,P,P′). Figure 7. MetBIO (control) and BIO (20 μM) treatment of E17.5 and E19.5 first molars for 6 or 4 days. Whole molar cultures analyzed by stereoscopic microscopy (A–D). Frontal sections of molars stained with hematoxylin-eosin (E–H′). These pictures show striking differences in the growth of the inner dental epithelium and in odontoblast differentiation of control (E,E′, G,G′) and BIO-treated (F,F′, H,H′) samples. Immunofluorescence for Nestin (I–L′) and Amelogenin (M–P′) in control and BIO-treated molars. Nestin labeled odontoblasts and spread to the subodontoblastic area (arrow, J,J′) in E17.5 BIO-cultures, whereas in the controls (I,I′), NNestin was restricted to the odontoblastic layer. In E19.5 cultures, both controls and treatments showed Nestin in odontoblasts (K,L′). The presence of amelogenin significantly decreased (N,N′) in E17.5 BIO-treated inner dental epithelium (N′, arrow) compared to controls (M,M′, arrow). E19.5 cultures treated with BIO (P,P′) exhibited slightly reduced amelogenin expression compared to the controls (O,O′). am, ameloblasts; od, odontoblasts; pd/d, predentin/dentin. Scale bar: 200 μm. The increased expression of Lef1 after culture of E17.5 molars with BIO for 48 h indicated the effectiveness of our treatment to overactivate the canonical Wnt pathway during differentiation stages in odontogenesis (Figures 8A,B). Figure 8. E17.5 first molars cultured with MetBIO or BIO (20 μM) for 48 h. In situ hybridization for Lef1 (A,B), Dkk1 (C,D), Bmp4 (E,F), Wnt10b (G,H), Shh (I,J) and Epfn (K,L). Sections of cultured molars showing that Wnt/β-catenin overactivation increased gene expression in dental epithelium (Lef1 and Epfn, B,L) and/or dental mesenchyme (Dkk1, Bmp4, and Epfn); however, Wnt10b and Shh (H,J) expression was reduced with BIO treatment. Scale bars: 200 μm. As occurs during the tooth morphogenesis stage, we found that during dental cell differentiation stages, the canonical Wnt signaling pathway also controlled the expression of Dkk1, Shh, Bmp4, Wnt10b, and Epfn. At E17.5, compared with the controls, expression of Dkk1 and Bmp4 was markedly increased in the dental mesenchyme of molars treated with BIO (Figures 8C–F). However, overactivation of Wnt/β-catenin significantly decreased the expression of Wnt10b and Shh, specifically in the inner dental epithelium of E17.5 tooth germs (Figures 8G–J). Epfn expression, as in the tooth morphogenesis stage, also increased in the mesenchyme of E17.5 molars after BIO treatment (Figures 8K,L). In this study, we have analyzed the effects of controlled overactivation of the Wnt/β-catenin route during the different stages of odontogenesis. We treated mouse embryonic dental tissues at different developmental stages with BIO, a specific and reversible inhibitor of GSK-3 activity. GSK-3 activity in vivo is negatively regulated by the insulin, Wnt and reelin signaling pathways, and GSK-3 also plays a pivotal role in the Hedgehog signaling cascade. Inhibition of GSK-3 by BIO has been shown to result in the activation of the Wnt signaling pathway and in sustained pluripotency in human and mouse embryonic stem cells (ESCs; Sato et al., 2004). Currently, there are mouse models that allow the study of constitutive activation of β-catenin in a tissue- and time-specific manner using tamoxifen-inducible Cre technology (Harada et al., 1999; Jia et al., 2013). However, in this study, we aimed to assess the effect of constitutive β-catenin activation through the inhibition of GSK-3 in the whole tooth. Due to the lack of specific Cre transgenic mouse lines that simultaneously target dental epithelium and mesenchyme, inhibition of GSK-3 in the whole dental organ with BIO was the strategy chosen for our studies. Thus, our model allowed us to analyze the specific effects of Wnt/β-catenin overactivation sequentially during the initiation (bud; E11.5), morphogenesis (cap to early bell; E14.5) and odontoblastic/ameloblastic differentiation (late bell; E17.5/E19.5) stages of odontogenesis. The results of this study stress the importance of the right balance in the activity of the Wnt/β-catenin pathway, as has been described in previous studies (Liu et al., 2008). According to this hypothesis, any anomalous activity of the pathway, by either inhibition or hyperactivation, causes structural and functional defects during odontogenesis. Moreover, in this work, we deepen the understanding of the relationship between the Wnt/β-catenin signaling pathway and the recently described transcription factor Epfn during odontogenesis (Nakamura et al., 2008; Jimenez-Rojo et al., 2010; Ibarretxe et al., 2012). One important aspect of Wnt/β-catenin activity during tooth development is its involvement in the regulation of tooth number. It has been reported previously that constitutive overactivation of the Wnt/β-catenin pathway generates supernumerary teeth in genetically modified mice (Järvinen et al., 2006; Chen et al., 2009; Wang et al., 2009). The constitutive stabilization of β-catenin through epithelium-specific deletion of exon 3 of the β-catenin gene using the K14-Cre transgenic mice resulted in continuous sequential tooth production from the embryonic molar tooth germs (Järvinen et al., 2006; Liu et al., 2008). Additionally, K14-Cre-mediated epithelium-specific deletion of the Apc gene resulted in the formation of extra teeth next to the molar and incisor tooth germs in the K14-Cre;Apc/cko mutant mice (Kuraguchi et al., 2006; Wang et al., 2009). In addition, it is very intriguing that constitutive stabilization of β-catenin in the developing palatal mesenchyme causes initiation of tooth bud-like structures from the palatal epithelium (Chen et al., 2009). In our in vitro model of isolated molar teeth, hyperactivation of Wnt/β-catenin during the dental morphogenesis stage (E14.5) did not generate extra teeth (Aurrekoetxea et al., 2012). This suggested that the induction of supernumerary tooth production occurred during earlier stages of dental development. For this reason, we overactivated the Wnt/β-catenin signaling pathway beginning at the tooth initiation stage. The upregulated expression of Shh, Epfn, and Fgf8 in the oral epithelium after the overactivation of Wnt pathway presumably indicates the formation of supernumerary regulatory centers, which are generators of extra teeth. Therefore, the critical period for induction of supernumerary teeth by Wnt/β-catenin hyperactivation occurs exclusively at the initiation stages of odontogenesis (dental placode and dental bud), during which treatment with BIO could cause an expansion of tooth inductive potential to other neighboring oral epithelial areas. BIO exposure at the morphogenesis and differentiation stages did not cause any increase in tooth number. Wnt/β-catenin signaling plays an important role in setting the size and morphology of the adult teeth (Sarkar and Sharpe, 2000; Cai et al., 2001). In the present study, we show that overactivation of the Wnt/β-catenin pathway during odontogenesis generates changes in dental growth and dental cell differentiation through changes in the expression patterns of certain key genes. For instance, during the transition from tooth morphogenesis to differentiation, WNT overactivation reduced Shh expression in the inner dental epithelium of cultured molars, whereas the expression of both Fgf4 and Fgf10 increased in the enamel knots and dental mesenchyme. Importantly, these changes correlated with some of the dysfunctions observed at later developmental stages, such as the impairment in ameloblast and odontoblast cell differentiation and increased dental size. In normal tooth development, Fgf4 functions as an activator of tooth cusps, and it can partially rescue the arrest of dental development associated with the inhibition of Wnt/β-catenin signaling (Kratochwil et al., 2002). Other important downstream effectors of Wnt/β-catenin are BMPs and SHH, whose activity is perturbed under conditions of Wnt signaling manipulation (Kratochwil et al., 1996; Cobourne and Sharpe, 2010). Our data suggest that imbalances in the expression of BMPs and SHH can generate dramatic odontogenic abnormalities. Downregulation of Shh in the inner dental epithelium correlated with the formation of abnormally blunted dental ridges. At the tooth morphogenesis stage, the expression of Shh in the enamel knot is upregulated by mesenchymal Fgf10 (Aberg et al., 2004) and downregulated by Dkk1 and Runx2 (Liu et al., 2008; Cobourne and Sharpe, 2010). In our work, the overactivation of Wnt/β-catenin increased the expression of mesenchymal Msx1 and Dkk1 and inhibited Shh expression in the dental epithelium. However, the expression of Shh did not disappear completely in the dental epithelium of molars treated with BIO. We propose that Epfn may play a role in this process. On the one hand, Epfn expression increased in dental epithelium and mesenchyme after treatment with BIO. On the other hand, in Epfn −/− mice, Shh expression is dramatically reduced in the dental preameloblastic epithelium at the bell stage (Jimenez-Rojo et al., 2010). These results indicate that expression of Epfn is necessary to maintain the expression of Shh in the epithelial region and that Epfn upregulation after Wnt/β-catenin overactivation prevents the complete disappearance of Shh from the epithelial enamel knot. Due to incomplete Shh signaling, dental ridges may partially form, but they will not reach the normal degree of development. One gene that is consistently upregulated after β-catenin stabilization is Dkk1. This is consistent with a feedback inhibitory effect to maintain Wnt/β-catenin activity within a physiological range. This feedback switch appears to be active both during dental morphogenesis (E14.5) and during dental differentiation (E17.5), based on the responses to stimulation with BIO. These findings reinforce the view that precise control of the activity of the Wnt/β-catenin pathway is necessary for proper tooth development. Therefore, isolated cultured molars react to BIO treatment by switching off canonical Wnt activity in an attempt to counterbalance this pharmacologically induced hyperactivity. 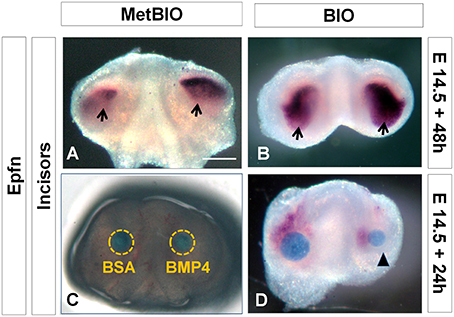 Previous results have shown an inductive relationship of Msx1 and Bmp4 in the dental mesenchyme during the transition from initiation to morphogenesis stage of odontogenesis (Bei and Maas, 1998; Kong et al., 2011). Likewise, it has also been shown that the Wnt/β-catenin pathway promotes the expression of Msx1, Bmp4, and Fgf4 (Cobourne and Sharpe, 2010; Galluccio et al., 2012). After β-catenin stabilization by BIO exposure, Epfn expression increased in the dental mesenchyme in the same way that Nestin did. Epfn protein is a transcription factor essential for proper odontoblast differentiation (Nakamura et al., 2008). In molars treated with BIO, odontoblast differentiation was delayed, which was also demonstrated by a reduction of Nestin immunolabeling and alkaline phosphatase activity, specifically in the areas containing the presumptive odontoblastic cells. However, the expression of Nestin and Epfn was largely increased in other areas of the dental papilla, which seems to be related to an ectopic mesenchymal differentiation to odontoblast-like cells. In addition, ALP labeling was much higher in BIO-treated dental mesenchyme than in control mesenchyme, again indicating a mesenchymal ectopic mineralization. Results from other groups showed that a similar phenotype is present in genetically modified mice overexpressing β-catenin in the dental mesenchyme (Chen et al., 2009; Kim et al., 2011). The occurrence of ectopic dentin and odontoblast differentiation in the dental pulp is associated with a human pathology called intrapulpal calcifications. This disease is characterized by the presence of large numbers of pulp stones in the dental mesenchyme. The presence of these pulp stones is very common in human teeth. Several factors that may cause this disease have been already described. However, it is known that there are also other stimuli that cause this disease and that have not yet been described. Moreover, some authors associate these pulp stones with regressive or degenerative changes (Zmener, 2009). This disease would be related to the activation of mechanisms governing odontoblast cell differentiation, such as the Wnt pathway. Therefore, overactivation of canonical Wnt signaling and the correlated changes in the expression of Bmp4, Nestin and mesenchymal Epfn may be a causative factor of this condition. The relationship between the Wnt/β-catenin pathway and cell proliferation has been studied in previous works, but the reported data depended on the analyzed tissue, and in some cases, the results were contradictory (Siriwardena et al., 2009; Manceur et al., 2011). In our previous work, we found that stabilization of β-catenin during the tooth morphogenesis stage stimulated cell survival and renewal in the mesenchymal region of the tooth (Aurrekoetxea et al., 2012). In the present manuscript, we show how this increase in cell proliferation is not exclusive to the tooth morphogenesis stage and that it also occurs during the stages of odontoblast and ameloblast differentiation. As a consequence of this effect on cell proliferation, the volume of dental mesenchyme significantly increased in BIO-treated molar teeth. Other studies have linked the expression of Fgf4 and Fgf8 with mesenchymal proliferation and delayed dental development (Kettunen et al., 2000; Gritli-Linde et al., 2002). Based on these data, we suggest that the significantly increased mesenchymal proliferation in the molars treated with BIO in different stages of odontogenesis is related to the dramatic increase in epithelial Fgf4 and Fgf10 expression detected in these molars. In summary, we can conclude that the stabilization of nuclear β-catenin induces increased FGF production and that this may be the reason for the significant increase in dental mesenchyme proliferation. Canonical Wnt/β-catenin pathway activity in the dental mesenchyme is closely related to the production of BMPs, and this induction controls multiple aspects of dental development, such as dental morphogenesis, the number of teeth, and dental cell differentiation (Shu et al., 2005; Hill et al., 2006; Chen et al., 2009; Fujimori et al., 2010). Our new data confirm that there is a positive inductive relationship between Wnt/β-catenin and BMP (Wnt-BMP) and that this induction is maintained during both dental morphogenesis (E14.5) and dental differentiation (E17.5). To date, no conclusive data had been obtained to explain in detail the relationship between Epfn and Wnt-BMP during dental development. We first reported the striking dental phenotype of Epfn-null mice (Nakamura et al., 2008). Later, we found that the absence of Epfn caused a decrease in the expression of Bmp4 and Dkk1 in early branchial arches (Jimenez-Rojo et al., 2010), which initially suggested a positive regulation between Epfn and BMP in the Wnt/β-catenin pathway. Subsequently, we showed that Epfn transfection of dental papilla-derived MDPC-23 cells induced a nuclear and cytoplasmic increase in β-catenin (Ibarretxe et al., 2012). Finally, the present results on dental germs induced to hyperactivate Wnt/β-catenin revealed a significant increase in Epfn expression in the dental epithelium and the dental mesenchyme. The data presented here suggest the presence of a positive feedback loop between Epfn and β-catenin, in which each activates the other, with the balance of their expression being essential for proper tooth development (Figure 9). In view of our results, we propose a positive regulation between Wnt/β-catenin and Epfn, which would be fundamental to determine the development and differentiation of the inner dental epithelium toward ameloblasts and of dental mesenchymal cells toward odontoblasts. Figure 9. Proposed model for the role of the Wnt/β-catenin pathway during odontogenesis. Overactivation of the Wnt/β-catenin pathway induces increased FGF expression. This may explain the significant increase in dental mesenchyme proliferation that causes an increase in tooth size. Based on our data showing increased Dkk1 expression after activation of the Wnt pathway, we propose a feedback loop between the Wnt/β-catenin signaling pathway and Dkk1. Our data confirm that there is a positive inductive relationship between Wnt/β-catenin and BMP. 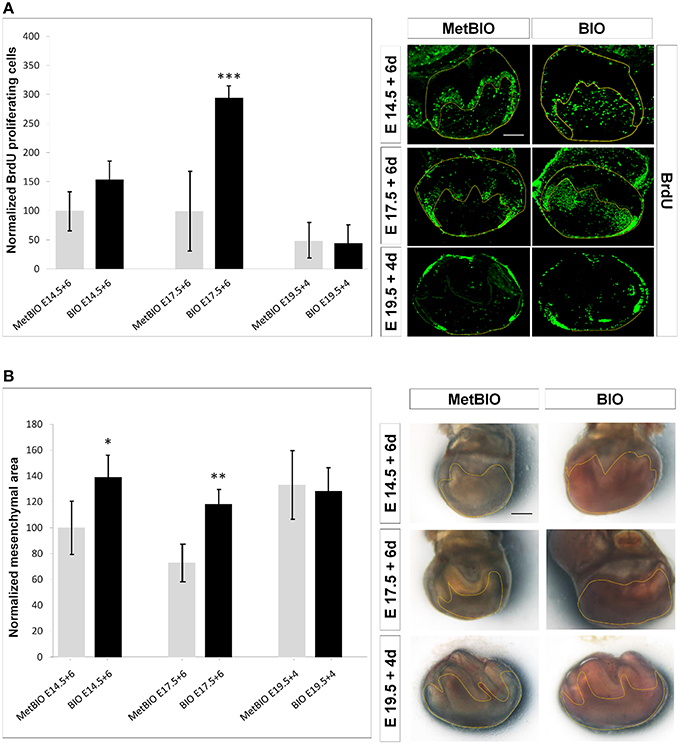 Overactivation of canonical Wnt signaling causes activation of Bmp4, Nestin and Epfn in the dental mesenchyme, which suggests ectopic differentiation of odontoblast-like cells. 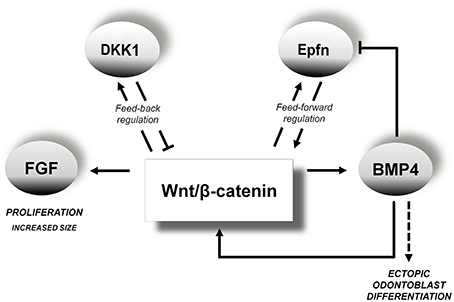 Based on our results, we propose a positive regulation between Wnt/β-catenin and Epfn. Our present results suggest the presence of a positive feedback loop between Epfn and Wnt/β-catenin. Similarly, our microbead results indicate the existence of a negative feedback loop between Epfn and Bmp4. Our results with microbeads showed that local application of Bmp4 downregulated Epfn expression during the dental morphogenesis stage. These data indicate the existence of a negative feedback loop between Wnt/β-catenin, Epfn and Bmp4 during tooth morphogenesis. According to this model, Wnt/β-catenin would activate BMP and Epfn, but the levels of expression of Epfn would be kept tightly regulated by BMP through a negative feedback mechanism. These novel findings may have important implications for our understanding of the regulation of tooth development. Thus, we propose that during dental development, Epfn expression would be highly restricted by the coordinated action of Wnt-BMP signaling, and this would govern fundamental processes such as tooth morphogenesis and ameloblast/odontoblast differentiation, as we first found by Nakamura et al. (2008). Our future works are designed to depeen the role of Epfn in the differentiation of ameloblasts and odontoblasts. Finally, our studies reveal that inhibition of GSK-3 with BIO disrupts normal tooth development. GSK-3 has been proposed as a therapeutic target for several human diseases. GSK-3 inhibitors, particularly small-molecule inhibitors, are currently being considered for the treatment of such pathologies (Phukan et al., 2010). Indirubin-3′-oxime (BIO) is a potent inhibitor of GSK-3, and it has been reported to inhibit cell proliferation and arrest cell cycle progression of various cancer cells. The therapeutic use of these compounds in combating proliferative diseases such as cancer, restenosis, and psoriasis has been proposed (Cuong et al., 2010). Regarding diseases affecting dental tissues, inhibition of GSK-3 has been shown to abolish the bone loss that occurs in periodontal disease in mice (Adamowicz et al., 2012). These findings suggest the potential use of small molecules such as BIO to treat dental diseases. Thus, understanding the effects of BIO in teeth is essential to avoid undesirable side effects that may affect normal dental function. MA: Concept and design of the research, experimental work, data analysis and interpretation and writing of the article. II: Experimental work. PG: Experimental work. LJ: Concept and design of the research. TN: Concept and design of the research. YY: Concept and design of the research. GI: Concept and design of the research, data analysis and interpretation. FU: Concept and design of the research, data analysis and interpretation, writing of the article. This work was financed with grants from the University of the Basque Country (UFI/11-44) and the Basque Government (IT831-13). MA and PG received a fellowship from the University of the Basque Country. The authors thank Ricardo Andrade and Alex Diez from SGIker (UPV/EHU) for their technical assistance with microscopy. Supplementary Figure 1. Cell viabilty and apoptosis analysis. (A) XTT assay for cell viability was performed in MDPC-23 cells cultured with 0-100 μM MetBIO or BIO for 24 h. Effective concentration EC50 was determined at 25 μM BIO. (B) Immunofluorescence for Caspase3 in E14.5 molars cultured for 6 days in the presence of 20 μM MetBIO or BIO. Apoptotic cells were mainly detected in the oral epithelium. Only a few apoptosis appeared in the enamel organ of the tooth rudiments, both in control and treated samples. Red dots were drawn to show the frontier between dental epithelium and mesenchyme. Scale bars: 200 μm. ALP, Alkaline phosphatase; BIO, 6-bromoindirubin-3′-oxime; BrdU, 5-bromo-2′-deoxyuridine; Epfn, Epiprofin/Sp6; E14.5, E17.5, E19.5, embryonic day 14.5, 17.4, 19.5; GSK-3, glycogen synthase kinase 3; MetBIO, methyl-BIO; Wnt,Wingless integration site. Bei, M., and Maas, R. (1998). FGFs and BMP4 induce both Msx-1-independent and Msx1-dependent signalling pathways in early tooth development. Development 125, 4325–4433. Cuong, N. M., Tai, B. H., Hoan, D. H., Huong, T. T., Kim, Y. H., Hyun, J. H., et al. (2010). Inhibitory effects of indirubin derivatives on the growth of HL-60 leukemia cells. Nat. Prod. Commun. 5, 103–106. Dassule, H. R., Lewis, P., Bei, M., Maas, R., and McMahon, A. P. (2000). Sonic Hedgehog regulates growth and morphogenesis of the tooth. Development 127, 4775–4785. Jimenez-Rojo, L., Ibarretxe, G., Aurrekoetxea, M., de Vega, S., Nakamura, T., Yamada, Y., et al. (2010). Epiprofin/Sp6: A new player in the regulation of tooth development. Histol Histopathol. 25, 1621–1630. Kettunen, P., Laurikkala, J., Itäranta, P., Vainio, S., Itoh, N., and Thesleff, I. (2000). Associations of FGF-3 and FGF-10 with signaling networks regulating tooth morphogenesis. Dev. Dyn. 219, 322–332. Kratochwil, K., Dull, M., Fariñas, I., Galceran, J., and Grosschedl, R. (1996). Lef1 expression is activated by BMP-4 and regulates inductive tissue interactions in tooth and hair development. Genes Dev. 10, 1382–1394. Lohi, M., Turker, A. S., and Sharpe, P. (2010). Expression of Axin2 indicates a role for canonical Wnt signaling in development of the crown and root during pre- and postnatal tooth development. Dev. Dyn. 239, 160–167. Lumsden, A. G. (1988). 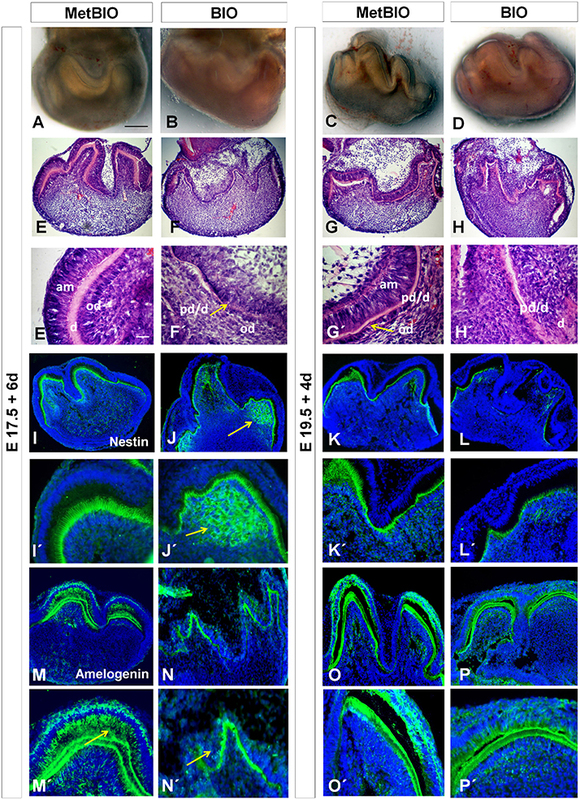 Spatial organization of the epithelium and the role of neural crest cells in the initiation of the mammailan tooth germ. Development 103, 155–169. Unda, F. J., Martín, A., Hilario, E., Bègue-Kirn, C., Ruch, J. V., and Aréchaga, J. (2000). Dissection of the odontoblast differentiation process in vitro by a combination of FGF1, FGF2, and TGFbeta1. Dev. Dyn. 218, 480–489. Zmener, O. (2009). Calcificación pulpar y endodoncia: estado actual, diagnóstico y posibilidades de tratamiento/Pulp calcification and endodontics: an approach to diagnosis and treatment possibilities. Rev. Asoc. Odontol. Argent. 97, 209–215. Copyright © 2016 Aurrekoetxea, Irastorza, García-Gallastegui, Jiménez-Rojo, Nakamura, Yamada, Ibarretxe and Unda. This is an open-access article distributed under the terms of the Creative Commons Attribution License (CC BY). The use, distribution or reproduction in other forums is permitted, provided the original author(s) or licensor are credited and that the original publication in this journal is cited, in accordance with accepted academic practice. No use, distribution or reproduction is permitted which does not comply with these terms.